The days of the LEGO name being synonymous with toy bricks and coveted construction sets is over, as The LEGO Movie showcased the many worlds alive within LEGO. 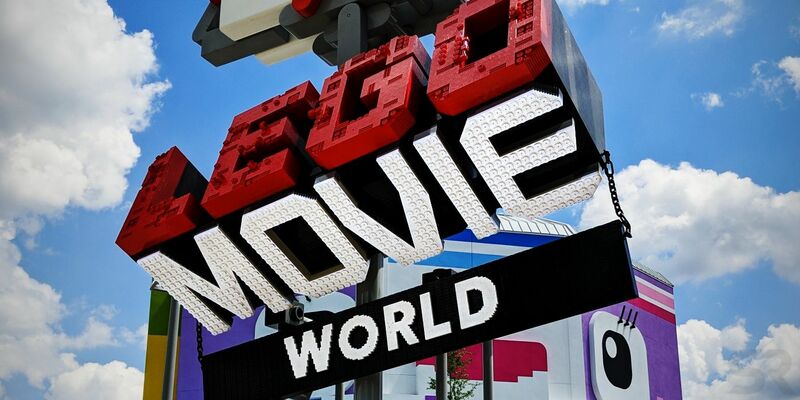 And with The LEGO Movie 2: The Second Part ensuring another generation of LEGO-loving families, the acclaimed movie series is being re-imagined into a physical space, thanks to The LEGO Movie World, now open for business at LEGOLAND Florida Resort. The attraction marks a new chapter for the LEGOLAND Resort, and a new ambition: to not only imagine a fully immersive world built from LEGO--an idea few could fathom before The LEGO Movie stunned audiences--but to now live up to the high bar set by the two Warner Bros. animated features. Now that children and families can take a walk into Bricksburg for themselves, the early results are in... and we doubt any LEGO fan will ever look back. "I started with LEGOLAND Florida in 2014, just after the first movie opened. And coming into the park I was surprised by how little we had activated this franchise in our resort. Through the years we've done some things, but it hasn't been to this scale. So for me, bringing to life The LEGO Movie franchise in the way that we've done with The LEGO Movie World has always been the vision since I first joined and saw the potential of that movie franchise. "We've been working with Warner Bros. for a few years now on the development of The LEGO Movie World. There was always a desire to have the opening of The LEGO Movie World be closely coordinated with The LEGO Movie 2: the Second Part... And then very quickly following, April 15th is the DVD and Digital release." 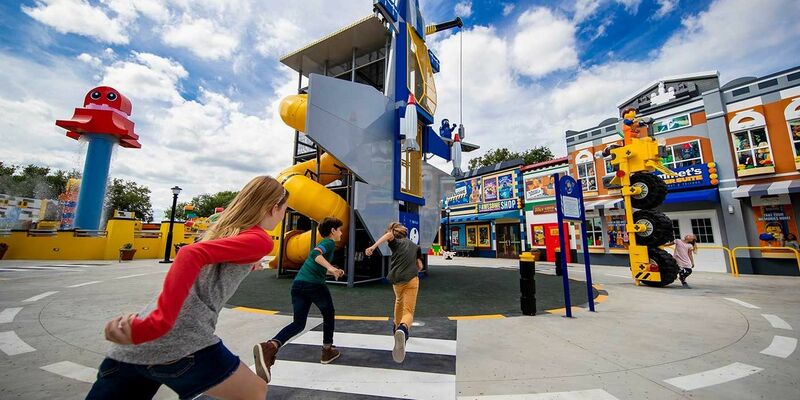 Once families have taken their second trip into The LEGO Movie's universe, flying from the under-siege town of Bricksburg to the Systar System and everywhere in between, they'll be primed for the rides and attractions featured in The LEGO Movie World. The most impressive, and sure to live up to its promised reputation as "the marquee ride" of the installation, if not the entire resort, is The LEGO Movie "Masters of Flight." 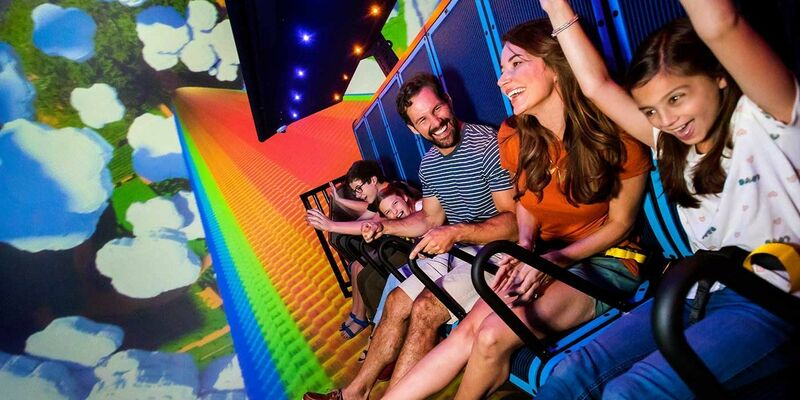 Featuring the only 180-degree turn on a flying theater in the world, guests are offered seats on Emmet's (significantly expanded) Triple Decker Couch and taken on a suspended ride surrounded by a full-dome virtual screen. Simulating the feeling of flying through a world created completely from LEGO bricks, the ride employs sprayed water and scents to simulate pirate battles and some of the sweeter worlds of The LEGO Movie universe. After taking in Benny the Spaceman's on-site space shuttle play structure located in the center of The LEGO Movie World, there's Unikitty’s Disco Drop, taking guests through a rainbow-filled journey based on Unikitty and her many moods. Once on the ride, guests will swoop to the tiptop of Cloud Cuckoo Land, then drop, spin and bounce back down to earth in sync with Unikitty’s wide range of emotions, creating a thrilling and frenzied experience. 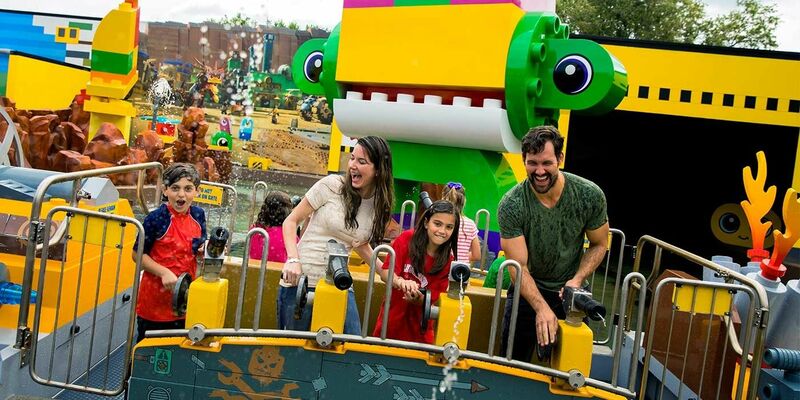 At Battle of Bricksburg, the only water ride at LEGOLAND Florida Resort, riders are challenged to stop DUPLOaliens from invading and stealing LEGO bricks by spraying water at targets from their boats. The riders aren’t the only ones who can enjoy playing in the water, as water cannons mounted along the exterior railings of the ride will allow guests to help the riders save the day. "The vision from day one was always when you enter through the portal into LEGO Movie World, that you are walking into downtown Bricksburg. So there was a lot of thought that went into that entry experience. You can see the immersion. There's a lot of height here, from the playground structure to the downtown area. That's intentional so when you walk in it's like walking into an urban environment where you feel immersed into it. Here you walk into downtown Bricksburg and all around you are the sights, the sounds--and the smells with tacos and Masters of Flight-- that you would expect to see in The LEGO Movie universe. The idea of LEGO Movie World meeting expectations runs through every installation and design detail, from areas for kids to construct LEGO while their families wait in queues, to lamp posts that look exactly like those of the LEGO variety. Right down to the dog constructed of LEGO bricks using that lamp post for... well, if you don't know what a dog would use a lamp post for, ask your child. "Warner Bros. had a strong interest in making sure that we were bringing the movies to life. Part of the challenge with the opening of this world--going back to that theater to theme park timeline--was we were developing a land that needed to expand the universe of two movies, yet the second movie was still in development. So we were working very closely to make sure that the characters we were adding, like General Mayhem that we see over there or the video [shown in LEGO Masters of Flight], were elements that were actually going to be in the second movie as well. So in terms of staying true to the vision, a lot of that was developing ideas and attractions that are in line with what the movie is going to deliver." With doors now open, The LEGO Movie World represents the most heavily themed, immersive land to be found in LEGOLAND Florida Resort. And in no uncertain terms, the first step towards bringing the success and visibility of The LEGO Movie brand into physical LEGO parks. After experiencing the park for ourselves, we hope that it's testament to the designers to say that it seems a no-brainer in hindsight. As impressive as it is to witness the seamless transition from theater to theme park--right down to the Taco Tuesday Everyday--the attractions themselves more than stand on their own. For those unfamiliar with the films, a trip into The LEGO Movie World is almost guaranteed to pique curiosity about the characters, locations, and storylines that inspired this physical space. "While the target is certainly those who have an affinity for The LEGO Movie universe, who have seen the movies, and know the characters, ultimately it was equally important for us to develop a land that if you've never seen the movies you can come in and ride the rides, enjoy the attractions, and walk away feeling like you still had an awesome experience. So the investment in the ride technology for Masters of Flight... The Battle of Bricksburg is our only water attraction in the park. On a hot summer day in Florida, whether you've seen the movie or not, you're going to have an awesome time when you get on The Battle of Bricksburg." That's not the kind of success that is arrived at by accident, nor is it likely to be a one-time affair. Jackson voiced his satisfaction with the project and those who helped make it a reality, and showed enthusiasm for the possibility of future expansions to the brand and resort. For now, though, the LEGOLAND team is enjoying a job well done. "Our goal is to put a smile on every child who walks into LEGOLAND Florida Resort. By the looks of excitement on the faces of our guests, I know we accomplished that today." To book your stay at LEGOLAND Florida Resort today, be sure to visit the resort's official website. This entry was posted by Screen Rant on April 15, 2019 at 6:04 am, and is filed under Interviews, TV News. Follow any responses to this post through RSS 2.0. You can skip to the end and leave a response. Pinging is currently not allowed.